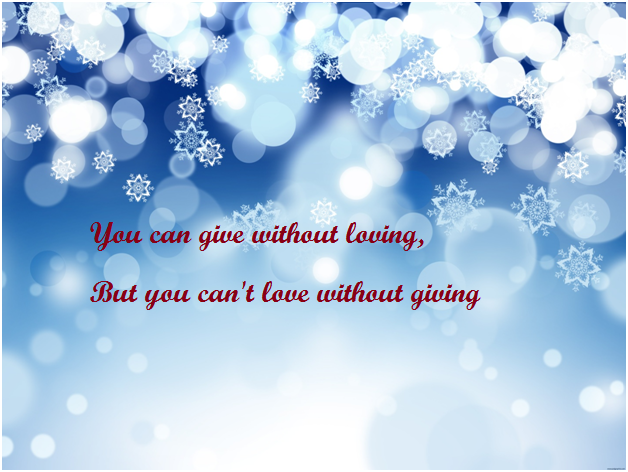 “Give out of love, not obligation. Give to show you care. Give something that takes personal sacrifice. 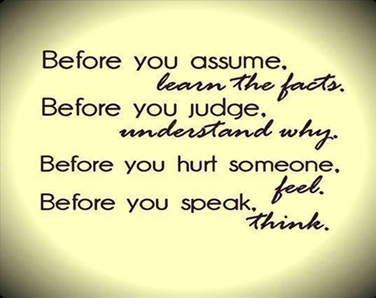 We have all heard others and ourselves speak our minds, form our opinions and come to conclusions. Some have blamed, threatened, looted and rioted. Others have shared information, their experiences and observations and peacefully marched. Some immediately took sides, while others kept asking questions. Some yelled out their judgments and rage, some silently condemned, while others, “tired of talking about it”, put their heads in the sand. But is anyone listening? Really listening . . . to the fear, the pain, the deeply rooted anger and frustration? Is anyone truly interested in knowing WHY people of color feel as they do or WHY the police react as they do? (If you have already formulated an answer, you are not LISTENING!). Is anyone interested in getting to the real root of the problem? The biggest communication problem is that we don’t listen to hear, we listen to reply. When we really listen, we often discover what we don’t know we don’t know, the knowing of which awakens us to a deeper truth, which we then realize we knew all along, and didn’t want to admit. To understand this, observe yourself closely. Observe your monkey mind that doesn’t want to be still and the jabber mouth that doesn’t want to be quiet. If you are already formulating your response when another person is speaking, or if you are being defensive or dismissive, you aren’t listening. Become aware of the information you allow into your Life View filter and the information you delete. Become aware of when you take “sides” in a situation like Ferguson and disregard the facts. You know you’re doing it, but you ignore it. You’re speaking so loudly, you cannot hear the truth within. You are not LISTENING to yourself. I’M SYMPATHETIC because I wasn’t there so I don’t know exactly what happened. Maybe Darren Wilson acted within his rights and duty as an officer of the law and killed Michael Brown in self-defense like any of us would in the circumstance. Now he has to fear the backlash against himself and his loved ones when he was only doing his job. OR maybe he provoked Michael and ignited the series of events that led him to eventually murdering the young man to prove a point. I’M OFFENDED, because of the insulting comments I’ve seen that are not only insensitive, but dismissive to the painful experiences of others. I’M CONFUSED, because I don’t know why it’s so hard to obey a policeman. You will not win!!! And I don’t know why some policemen abuse their power. Power is a responsibility, not a weapon to brandish and lord over the populace. If you think there aren’t a lot of police who profile people (consciously or unconsciously) and use the power of their badge to unjustly abuse people of color, especially Blacks, then you aren’t listening. If you think there aren’t a lot of Blacks who are perpetuating the negative, racial stereotyping and suspicion through their own behaviors, limiting beliefs and attitudes, then you aren’t listening. If you think there aren’t a lot of police who respect their position of authority and are genuinely doing their best to do their job in a conscious, responsible, lawful way, then you aren’t listening. Maybe you should meet one and spend the day with him/her. If you think there aren’t a lot of Blacks who live exemplary lives living within the law, who contribute to their community and raise responsible, polite, respectful children, then you aren’t listening. Maybe you should meet one and spend the day with him/her. Discover what it’s like to be these people. Deepen your understanding of what they face every single day, how they think, what they feel, what they’re afraid of, what they want . . . and LISTEN until you truly HEAR them. And if you think all of this has nothing to do with you, if you think your own actions, reactions and inactions don’t influence the racial problems we face, then you need to wake up, look around and start listening to the world you have helped create. Something is seriously not working! We need to listen to ourselves and to each other. We need to seek to understand all views. We need to face the real truth and take accountability for the role each and every one of us plays in either perpetuating the racial problem through our own ignorance, bias, fear and reactive self-righteousness or in solving it by being willing to LISTEN and really hear. We need to be willing to be uncomfortable, very uncomfortable, face our own ignorance and be willing to admit that positions we have held on to so tightly may very well be incorrect. We need to be more committed to human life and having our system work than we are to being right. Is there injustice in this world? YES! Is racial profiling real? YES! Are people often unaware of the racist and/or victim filter through which they see the world? YES! Is our criminal justice system out of balance? YES! Are all lives treated with equal value? NO! How you (yes YOU) and I respond to this injustice is what makes all the difference.